For the past 50 years, Mike Shannon has been either creating or describing memorable moments in St. Louis Cardinals history. "For many Cardinals fans, Mike Shannon has become as much a part of Cardinals baseball as the "Birds on the Bat", Cardinals' Chairman William O. DeWitt, Jr. stated recently while honoring Mike for a half-century of service with the team. 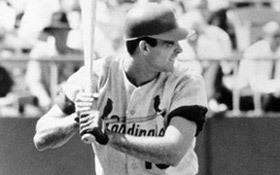 Shannon, who first joined the Cardinals organization in 1958 after a standout prep career made his Major League debut with the Cardinals in 1962. He became the Cardinals regular third baseman during their 1964 World Championship season and was a part of three Cardinals World Series teams (1964, 1967 & 1968). During the '68 season, Shannon hit a record 26 game winning RBIs and was voted All Major League Third Baseman by the Associated Press. "For many Cardinals fans, Mike Shannon has become as much a part of Cardinals baseball as the "Birds on the Bat"
After his playing career was cut short due to illness, Shannon joined the team's front office staff in 1971 and he started his broadcasting career in 1972. 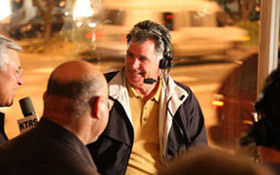 In his 36 seasons as a member of the team's radio and TV broadcast teams, Shannon has been a part of five Cardinals World Series seasons (1982, 1985, 1987, 2004 & 2006) and was awarded an Emmy in 1985 for his work on the baseball telecasts. Prior to his tenure with the Cardinals, Mike Shannon had already established himself as one of Missouri's top athletes. During his years at CBC High School and University of Missouri, Shannon excelled at baseball and football. To this date, Shannon is the only athlete to be named Missouri Prep Player of the Year in basketball & football in the same year. In 1999, he was inducted into the Missouri Sports Hall of Fame. Shannon's rapport with sports fans and players makes him a favorite on the speaking circuit throughout the USA. Mike has raised over a million dollars for charities. His most recent charitable efforts have been directed towards The Mike and Judy Shannon Brain Tumor Research Fund established in honor of his wife. Among the more recent awards given to Shannon are: The St. Louis Ambassadors' 1993 Sportsman of the Year Award; in 1994, the Christian Brothers Letters of Affiliation, the highest honor bestowed by the Brothers on persons who have given so much without acclaim or any desire for reward. Mike was also named 1996 Champion For Kids by the St. Louis Variety Club.